I don’t know how we go through so much food in this house. It’s just the two of us. Seems like we are always out of something. Oh well, had to run to pick up a few things at the grocery store. Then we headed over to have an early dinner at the Chinese Buffet. It was so good. 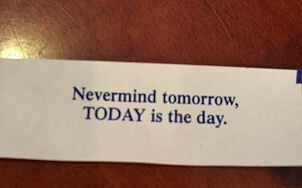 This is from my fortune cookie from today. So since I had the ancient fortune tellers sending me this message, I decided it was time to go to Lowes and pick up my paint cards for Bonnie Hunter’s winter mystery from this year. The first of the information was posted by Bonnie in October, and it just finished last Friday. I guess you could say I procrastinate when it comes to mystery quilts. Since Bonnie is the Queen of Scrap Quilting, I like to wait until the mysteries are revealed to see if I want to keep the same colors that Bonnie uses and if I do indeed want to make a scrap quilt. Well I have to say Bonnie’s quilt is absolutely beautiful. So I did indeed go with her color choices. :). I also got the button for my blog for this mystery. Bonnie’s inspiration was the Italian area of Tuscany. The mystery’s name is “Allietare” which means Gladden. I have all the buttons for all the mysteries Bonnie has done since I have known about her. They don’t remain on her blog for very long after the reveal because she often includes them in her next books. But I have all of the info saved and I have actually pulled my fabrics for each of them and started a couple. I will definitely get them done. Bonnie is so gracious to share her time and talents with us. Stop on over at Quiltville Quips N Snips, just follow the link on my sidebar.